The Raleigh Chopper is a children’s bicycle, a wheelie bike, manufactured and marketed in the 1970s by the Raleigh Bicycle Company of Nottingham, England. Its unique design became a cultural icon, and is fondly remembered by many who grew up in that period. 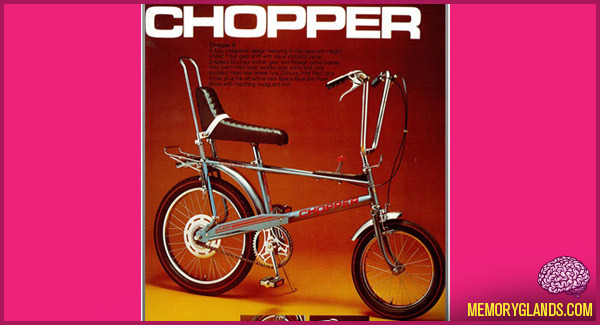 Based on the look of a customised chopper motorcycle, made popular with films such as Easy Rider, the Chopper bike was the “must have” item and signifier of “coolness” for many children at the time.